Well, I've done it. I've gone over to the dark side. Blame it all on Santa for leaving that nice, shiny, new Kindle under my tree yesterday morning. I know what some of you are thinking, because believe me, when it came to e-readers in general, I thought the same thing for a very long time. They're silly, frivolous, useless. Getting one means betraying print books and that very lovely, sacred act of cracking open a book and the smell of paper and the sound of pages fluttering as you turn them. The shiny, light weight of some device can never replace the reassuring heft of the weight of a nice, thick book. Yes, yes, yes, it's true. But, seriously. This Kindle is awesome. I love the Pearl Ink technology, which basically means that instead of working like your computer or phone screen, with a bunch of pixels and other bright stuff that frankly I don't understand (I don't question it as long as it works), the Kindle has ink underneath its screen that is rearranged digitally whenever I flip the page or change the screen. It's kind of a neat effect, and I find that as I read, I want to brush my fingertips against the screen because the contrast of the letters is so sharp, it's almost as though they are an embossed surface. This also means that whenever I turn the Kindle off, the ink is arranged into a photo (mostly of famous authors, works of art, etc.) that is left on the screen without wasting any battery power. My cousin said it best--think of it like a digitally powered Etch-A-Sketch. I've read two whole books on my Kindle (Wish by Alexandra Bullen, because Scholastic is offering it for FREE everywhere until January 3rd and then Beauty Shop for Rent by Laura Bowers), and downloaded quite a few more, and I am really loving the way it reads. I know one major concern was the page flip time, and I never had a problem with it. There are two buttons on either side of the Kindle that allow you to flip both forward and backward, which means I can hold it with my left hand and not have to move my right hand up to flip the page (supreme laziness--I love it!) and the page flips quickly, but not too quickly. It's perfect. So far my only complaint with the Kindle thus far is that I would love to have page numbers on it. There is a little "status bar" (for lack of a better term) on the bottom of the screen that visually tracks your progress, and shows you what percentage of the book you've read thus far. There is also a Locations thingy, but I'm not entirely sure that it refers to--at first I thought maybe lines, but that's not the case. So, while these things are helpful and I don't mind them, I still sort of would prefer page numbers--I am a creature of habit after all! Anyway, that's just a brief overview of my thoughts on the Kindle right now. I do have two friends that have e-readers--one has a Nook, and the other has a Nook Color. I am getting together with my friend with the Nook Color later this week for some book talk, and I'll be taking notes for a comparison piece that will go up on the blog soon. I still love the feel of old-school print books, and I don't see myself giving those up anytime soon. I am pretty picky about what I buy digitally, and I know that despite the added cost of a physical copy, I will probably be going for actual books 80% of the time as opposed to an e-book. However, I also am very open to trying new things and finding devices that make my life a little easier, and as an avid reader and college student with over 15 books to buy each semester and very little living space, I can't help but be a little on love with this Kindle. I got a Kindle for Christmas, too. And, despite feeling a bit naughty about the whole thing, it's pretty darn nice! *Shakes my finger at you* Shame shame shame! Lol I still refuse to cross over. I just don't think it's for me. I love the smell of books and I enjoy seeing them on my shelves even though I don't have the space. Got my kindle a couple of months ago and love it, but I too, still read probably 80% of my books in "paper" form. The e-ink technology is GREAT, and it's nice to be able to get free books from NetGalley and other places. Have fun, and hope you enjoy! 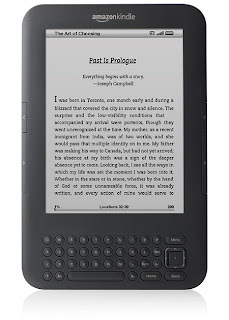 I'm another brand new Kindle convert here at (in?) the dark side with you. My husband gave me one for Christmas and I love it for all the reasons you mentioned. (And I agree, I would love page numbers too.) I don't plan on giving up my printed books, but I adore how we can read sample chapters ... which might help pare down my TBR. Carly: Staples has Kindles you can touch and look at! Definitely go and check one out. 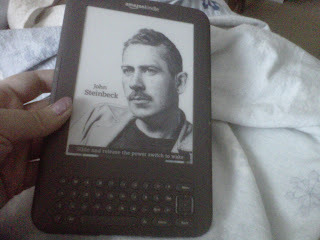 It was what ultimately made me decide on the Kindle. I bought a Kindle in September and love it. I can't imagine giving up print editions. I love the library too much! And not to mention I can't afford to purchase every book I read. I was surprised how easily I adapted to reading a book vs reading it on my Kindle. Within minutes I forget I was reading a book on a device. Like you, it took me awhile to jump on the ereader train. But now that I have, I'm glad that I did. Welcome to the wonderful world of the amazon Kindle. I'm an early adopter. I've owned one since 2008. Love, it! Just updated to the 3rd Generation kindle. I can't wait to read your comparison! My husband gave me a Kindle, too. And wow, it is user friendly. My kids love it, too. The big thing for me, I think, is that instead of checking out so many library books, I'll download more samples to try. Is it weird that the author pictures, etc. delight me so? 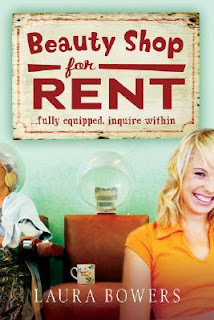 Also - Beauty Shop for Rent is FANTASTIC.